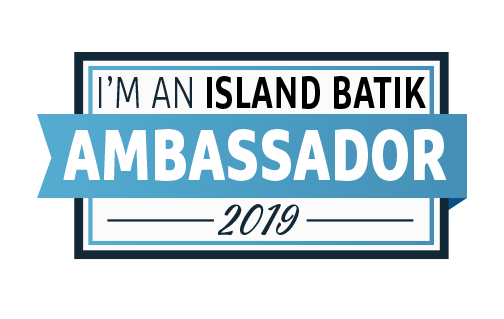 The March challenge for the 2018 Island Batik Ambassadors was to try a new Technique. Most of us are longtime quilters, instructors and/or designers, so for many of us, the hardest part of the challenge was to come up with a tool or technique we haven’t already tried! Fortunately, I had a couple of tools designed by Phillips Fiber Art that I had not had time to play with yet – The Gems 5 & 10 and Gem Star tools. I started thinking about what sort of project I could make with the pieced and appliqued 5-pointed stars these tools make. I was surfing the internet in search of inspiration when I came across Diane Harris’s posts about a class she was taking on improvisational quilting. My muse tapped me on the shoulder and reminded me that the President’s Challenge theme I had chosen for my quilt guild this year is Wing It. “We can answer two challenges with one project,” says he. We began with the fabric pull. I started with the collection of basics supplied by Island Batik. I chose a dark green for my big pieced star. I also decided that I had to use this yellow and magenta blend because…well, to be honest, since I had little confidence this project was going to turn out, I wouldn’t be too upset if, in the end, I felt like I had wasted it. Then I pulled out my bag of Island Batik scraps and came up with more greens and pinks, and decided to add a copper-brown print from the basics. In the end, I didn’t use the three lightest greens or the light pink, but at this point I still didn’t know what I was making. Better to have too many colors than not enough. First came the pieced base. I made one large dark green star with the Gem 10 tool. The instructions that come with the tool are well-illustrated. In a nutshell, you sew stripsets, then use the tool as a template to cut wedges. There are five wedges with the darker green, and five mirror-image wedges with the slightly lighter green. Two wedges make one star point wedge. So, we start with a pieced 5-point star. I have to say, the tool is terrific and easy to use. It makes a very large star, but there is also a Gem 10 Junior tool available if you want a smaller project. But I digress. As it happens, the piece is a decagon shape. It works great for the several patterns Phillips Fiber Art has designed for the Gem 5 & 10 tools. However, my Muse and I had decided we wanted a square wallhanging. At this point, Muse left the studio. I hate it when he does that. After several hours of thinking, slicing, patching, piecing and trimming up, I had a square-ish base piece. I couldn’t say I was happy with it, and frankly, I was feeling more than a little stressed out because I didn’t even know which side was top, bottom, left or right. I had no clue where I was going with this project. Finally, I convinced myself that if I didn’t love it, at least I didn’t hate it, and it was time to move on. Making the applique stars with the Gem Star tool was the most enjoyable part of this project. There’s a clever little trick for getting those points so pointy, and the only difficult part of the whole process is getting the center to match up. Most were oh-so-close, but this gold one is dead-on perfect. When these stars are finished, the edges of the points are turned under already, so it’s a simply matter to applique them down, whether you you want to hand-sew or machine-sew them. I didn’t have any idea how many stars I needed or where they were going to be placed, so I just started making them in several sizes. In the end, I made more than I needed. The extras may become Christmas ornaments. Quilting is very simple on this piece. I stitched 1/4″ inside and outside the perimeter of the large pieced star, then echo-quilted straight lines in the gold background, and straight lines across the magenta corners. Using my quilting guide bar, and my seams as a pivot point, it was easy to make straight, evenly-spaced quilting lines. I sewed a 1″ spaced line, then two 1/4″ lines, then 1″, two 1/4″, repeating until the space was filled. The more I played with the stars, the more I felt something just wasn’t right with the base piece yet. It was the gold areas. After stewing over it for a few days, Muse resurfaced and suggested I add a few lines of quilting that might actually be visible in the gold areas. It’s amazing how just a little detail can make such a big difference. Those two lines of magenta quilting were just what this piece needed to pull it all together. Note to Muse: It would have been easier if you had suggested it before I appliqued the stars down. Just sayin’. So, is it finished now? I don’t know. Hence, the title – Am I There Yet? After all, if you don’t know where you’re going, how do you know when you’ve arrived? The fabrics used in this piece were supplied by Island Batik. The threads are from Aurifil, and the batting from Hobbs. You see, I had purchased a copy of fellow ambassador Carole Lyles Shaw’s book Madly Modern Quilts. I’ve always loved the 9-Patch, so her “Fractured Disappearing 9-Patch” project really appealed to me. Check Carole’s blog post and you’ll see how she works her magic. It seemed simple enough… make a 9-patch, slice it up, sew it back together, slice it again, insert a strip, and voila! Nope. Didn’t happen. My muse likes to know where a pattern is going before we begin construction, and having just spent months trying to work through an improvisational project, he would not cooperate. So we compromised, my muse and I, and came up with the Highland 9-Patch. It’s still sliced and spliced, but looks nothing like Carole’s. I did begin with a 9-Patch. Mine has an 8″ square of navy blue in the center, 9″ squares of a bright green in the corners, and the side “squares” are actually 8″ x 9″. Then I added a 2″ border all around the block. …and spliced in a 1″ strip of navy blue. Then I did the same thing, slicing and splicing in 1″ horizontal strips. After that, it was a simple matter to add wide borders of the background fabric. My friend Kathy at the Creative Needle quilted it in an all-over leafy pattern, and I bound it in navy. The Highland 9-Patch is 56″ x 72″, so it’s a nice lap-size quilt. I began quilting in the early 1970’s, so I have pretty much seen it all, as quilting has developed from a scrap craft revival to a celebrated artistic genre, from Grandma’s hand-quilting frame to computerized longarm quilting machines in nearly every quilter’s studio. I have to admit, I dismissed the Modern Quilting Movement early on as a “fad”, but I’ve always loved big, bold, graphic art, and since it seems Modern Quilting is here to stay, I’m in! The fabrics used in my Highland 9-Patch are from Island Batik. Thread was provided by Aurifil, and the batting by Hobbs.